Being a keen supporter of the Angling Trust, I am anxious for its achievements to be publicised. So here goes. This time the subject is predation, as it applies to fish stocks, and predator management. The chief angling bugbear over recent years has been the issue of cormorant numbers. The RSPB, predictably, maintained that cormorant numbers did not need to be reduced, and Natural England thought that fishery owners and angling clubs could deter the birds from raiding angling waters by bursting balloons overhead. • The funding of three fisheries management advisors (FMAs) employed by the Angling Trust with effect from April 2014 in order to assist angling clubs and fishery managers with the reduction of predation and co-ordinate applications for control licences. • Agreement to increase the national limit from 2,000 to an emergency level of 3,000 for 2014/15 if this can be shown to be necessary. One of the glaring untruths of the EA review of the UK natural environment a couple of years ago was the suggestion that rivers had never been healthier. This was in part shown, it was claimed, by the presence of cormorants and otters in numbers. Any experienced river angler would see through this argument immediately, since he would be aware that a large number of UK rivers, despite good water quality, have fish populations which are below par in terms of numbers. The BBC of course repeated its own glaring myth, in the context of the fairly recent ‘State of Nature’ report, that the return of otters was somehow, amidst the general sorry decline in wildlife, a heart-warming (well, they have a nice cuddly look, don’t they?!) success story. Whist we are on the subject of healthy ecosystems, if you live in the south of England, you will be in no doubt that the only really ‘healthy’ population in some rivers is that of signal crayfish, which devastate fish populations by consuming large quantities of eggs and fry. Every bit of a country like the UK is in some way managed; some areas are managed more than others of course. This also applies to lakes and rivers, where predator control has become a pressing need. In other words, as anglers we need to be able to apply our own forms of management so that we can continue to enjoy our sport. One of my local angling clubs is attempting to do precisely that, by removing thousands of signal crayfish from the river they have colonised in huge numbers. This will without doubt make quite a difference, but it is a real labour of Hercules, a short-term measure which will no doubt need to be repeated before too long. As far as long-term solutions to the signal crayfish problem are concerned, the Angling Trust has joined forces with Cefas, along with a host of volunteers from angling clubs and others, to find the most effective ways of reducing the problem. In the longer term, the EA and Natural England are supporting the work by researching the possibility of male sterilisation or other methods of scientific control. The Angling Trust has necessarily to tread a fine line between the interests of angling and those of other wildlife and conservation groups with which it of necessity needs to be allied. Natural England and the EA may have aims which overlap our own, but we should not rely on it. There is, of course, also the necessity of preserving the good name of angling. We do not wish to be seen as just ‘nasty anglers who shoot birds’, and indeed we are not that; we play a positive part in conservation activity by setting up and maintaining fisheries. And most of us, whether we realise it or not, have a practical, hands-on appreciation of how ecosystems and food chains work. But many members of the general public, and of course many politicians, will not be aware of this fact, so at the same time we need our own PR effort. Also, the Angling Trust has to act in a way which does not affect the positive image of angling which large numbers of the general public have: it needs to demonstrate the need for effective predator control through lobbying government ministers and influencing other interest groups, notably the likes of the RSPB, which enjoys huge public support. It is worth repeating here by the way that the RSPB has more members who are anglers than the Angling Trust has individual angler members. To date, the Angling Trust has made good progress, even given its size and slender resources. 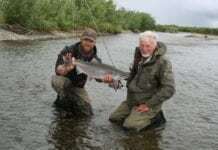 But support in terms of numbers of individual anglers is still very low indeed. If more anglers decided to join, then we would be able to exercise more influence to support our cause. 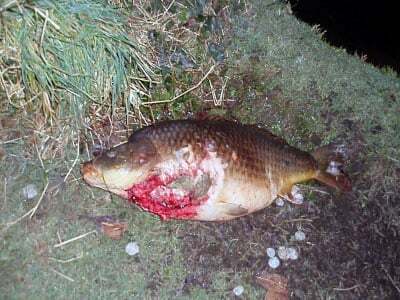 But of course (and again I make no apology for repeating this – yet again) the Angling Trust needs to grow, or else it runs the risk of finding itself without an effective enough voice. Without a strong representative body, we may not always be taken seriously as an interest group. This means higher numbers of individual members with their subscriptions and/or donations. Or to put it in hard ecological terms, if we do not stay strong and united, we anglers run the risk of disappearing down the mouth of some stronger rival interest group – and becoming, figuratively speaking, another sorry victim of predation.